A hydroseeder sitting there collecting dust doesn’t do anyone much good. There is a great demand for hydro seeding. 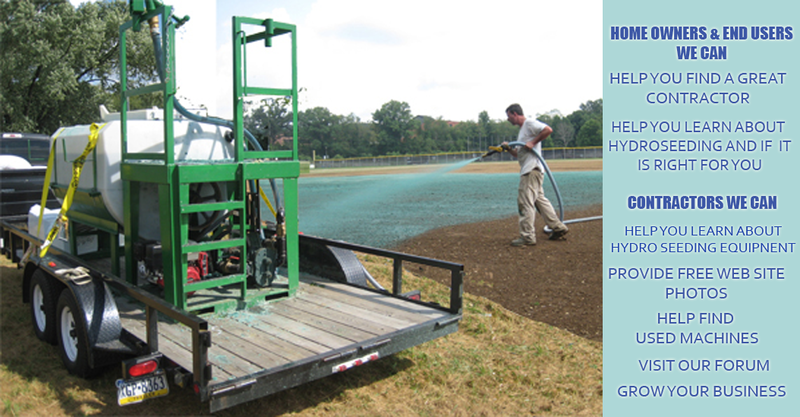 Here are some ideas to increase the hydroseeding part of your business. # 1. JOIN THE IAHP. The International Association of HydroSeeding Professionals is a great organization that is very affordable. One of the many benefits is that hydroseeding contractors get a premium listing on www.HydroSeedingExperts.com which is a very popular site for those looking for a hydroseeding contractor for a job they have. Contractor membership is only $ 100.00. One job will pay for that. Members get lots of calls from their listing ranging from small jobs to large erosion control and construction projects. Turbo Turf owners are also eligible for a free standard listing on this site. If you are a Turbo Turf owner and are not listed please contact us for your free listing. # 2. Good signs on your trucks and equipment. The cost for good graphics is small and someone seeing you doing one job may easily generate new business for you. This is especially true when seeding new homes In a new development where others with a home under construction will soon need their lawns seeded but is a very effective way to grow your business. # 3. A good website. This is becoming more and more of a digital world and internet searches are the way people find contractors to do their work. Web sites don’t have to be expensive. Another free option that is good but not as good would be a facebook page which is free. # 4. Contact home builders and construction companies in your area. This is an effective way to get customers who will turn into repeat customers. A phone call or mailing is all it takes and it is a great way to grow your business. #5. There are lots of other options such as radio and newspaper advertising, lawn signs, door hangers, posting business cards on bulletin boards and lots more. The business is out there and you can go get it.